Gaming related blabs that go off on tangents more often than a calculus class. I'm trying to get into an exercise routine. It's hard because swimming is fun but the hours for the pool require you to either be a vampire or an insomniac. I've been trying to get out and walk more but the rain lately wasn't helping. I'm sure I could get to a place where I'll go walking, rain or shine, but I'm not quite there yet. It hasn't helped that this year has been one of the best on record when it comes to videogames. I was drowning in content and that was BEFORE Persona 5 dropped in early April. I've also picked up a Switch recently and Zelda is consuming me. The upside of having so many really great games so early in the year is that it is easier for me to resist the siren's call of the new stuff coming out now. My stamina wasn't terribly high for the past few months, both due to the surgery and also just general laziness. I'm getting my feet back under me at work now (it's been crazy!) and I was able to survive almost an hour in the lane swim yesterday without having a coronary. Posted by Brock at 12:53:00 a.m. So today was my birthday. Woo! I'm still around and mobile, so that's a blessing. I guess I haven't posted since just before my surgery, so as you can see, that went well. No more crazy distended bellybutton for me! As I kick off yet another personal trip around the sun, I'm looking forward to (hopefully) spending more time actually getting into some kind of shape that isn't just round and buoyant so that I'll be around for a few more birthdays. I've also been reading more (and not just comics) so that's a trend I'd like to see continue. As much as I like my videogames, I'm finding that it's just as pleasant to spend an afternoon just reading a book in a comfy chair as it is to save the universe on the TV... What's old is new again, I guess. So thanks everyone for all of the well wishes and feel free to bug me about getting out there and riding my bike or at least walking regularly and maybe not eating quite so much garbage. I'm not as young as I used to be! Oh, and if you have a chance and are so inclined, spare a prayer or happy thought for my grandparents. My grandpa isn't doing too well these days and that's also wearing on my grandma, who can't go to see him as often as she'd like. They'd really appreciate it. Posted by Brock at 11:40:00 p.m.
Well, tomorrow (today?) is the big day. I'm going in to get my hernia fixed since my previous healing method of 'walk it off and ignore it' didn't seem to do the trick. It's supposed to be a relatively short surgery (about 1.5 hours) and I'll hopefully be home before dinner. I probably won't want to eat any dinner for a while after it's all said and done though. Any and all prayers and happy thoughts would be appreciated! Of course I'm having the surgery the day before Julie's birthday. I knew that the one thing she'd want more than anything else in the world is to get to spend more time with me while I complain about how sore I am. I'm caring like that. 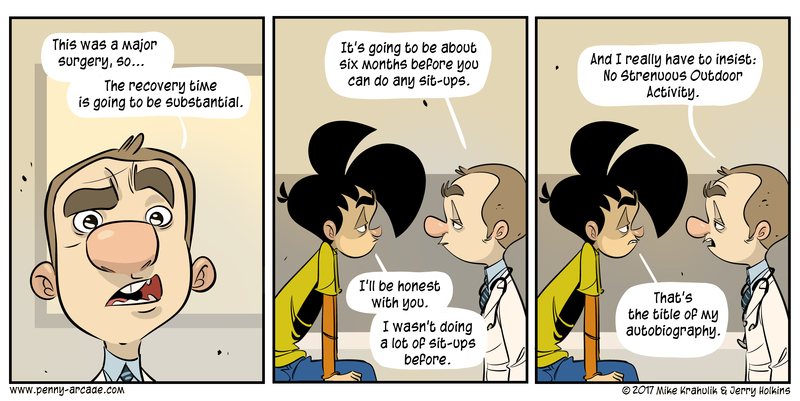 Oh, and in a bout of serendipity, it appears that Mike over at Penny Arcade just had hernia surgery. I thought that this comic was rather apropos. Posted by Brock at 12:15:00 a.m.
Well, we survived 2016. At least some of us did! Personally, this wasn't a complete train-wreck of a year but I'm happy it's over. 2017 hasn't had a chance to kick us in the face yet and if nothing else, it's shaping up to be a potentially interesting year. Next stop: it's our 18th anniversary in a day! Woot! Posted by Brock at 12:05:00 a.m.
Feel that? It's you. You're old now. Well, it's official. I'm old now. No longer in my 30s, I'm officially a member of the 40 year old club. I had a lovely birthday though. Even though I was on the mend from a whiplash bout of the flu, we were able to head out to Guelph for the morning and visit the College Royal open house and throw some fireballs and do science, so that was fun. Afterwards, we went to Burgers Priest for lunch and then came home for my party. We had a few friends over and we played Telestrations and then a bunch of JackBox Party Pack 2 games. Much laughter was had and everyone left with a smile on their face. I may not be a wild partier (and I was definitely not up to my usual super goofy levels that night) but I had a fun time and it seemed most other people did too. Of course, in keeping with my hitting a milestone, I had one of my teeth break at midnight on the night of my birthday (thankfully it was a molar that had already been deteriorating over the past few years following a root canal and it is more annoying than painful) so that was a hoot. And my daughter, bless her heart, gave me a creepy homemade card with the following lines. "Feel that? It's you. You're old now." Posted by Brock at 11:39:00 a.m. This has been a pretty sucky year for skiing, I tell you what. I got ski passes for both Garrett and myself and we've been out a grand total of 1 time since the hill opened in mid-January. Since then, there's either been no snow (stupid thaw) or the temperature has been hovering just above absolute zero. And people wonder why I complain about Southwestern Ontario winters. Snow or don't. I hate this bipolar nature. Today seemed to be settling into something resembling a regular winter though and hopefully we'll get some snow over the next few days so that we can hit the slopes mid-week. I just want some powder to ski on! Posted by Brock at 8:48:00 p.m. I've set a pretty low goal for this year, since I'm not sure how well I'll do. If I do well this year, then I'll pump up the goal bar for next year! Anyway, please click below. I'd be happy to have whatever you feel like tossing into the hat! Posted by Brock at 8:45:00 p.m.
RIP 2015 - Hello 2016! Well, 2015 has been an interesting year. Lots of changes at work, but (almost) all for the better. Things have been going rather well on the home front as well, if you don't count the fence that is collapsing in the backyard and the fact that my car is about to die a horrible death one of these days. I know that I'm looking forward to 2016 as a year to put a lot of the lessons learned in 2015 into practice, especially at work. And while I was at work a LOT in 2015, I also think I started to finally slow down a bit and pay more attention to family life and appreciate the quiet evenings when we could all just hang out and do things as a family. We're looking forward to the big birthdays in 2016 (both of us are teetering on the top of the hill and are about to be over it as of 2016) and I'm fascinated by what wacky stuff the kids will get up to next. I will leave you with this, the Doctor Who LEGO movie that my kids spent all day working on! Enjoy and have a safe 2016!!! Posted by Brock at 8:30:00 p.m. I'm actually a script that runs on blogger and randomly spouts out strings of words. Amazingly, they all seem to make sense and use something approximating proper grammar.